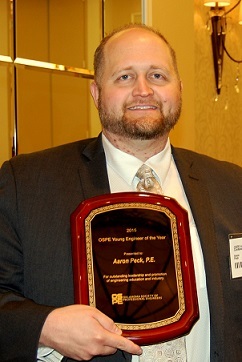 Tulsa-based GUY Engineering Services, Inc. (GUY) is pleased to announce that Aaron Peck has been selected as the 2015 “Young Engineer of the Year” by the Oklahoma Society of Professional Engineers. Each year, only one “Young Engineer of the Year” is selected based on educational and collegiate achievements, professional and technical society activities, civil and humanitarian activities, professional experience, and achievements within the field of engineering. Mr. Peck’s professional career began at GUY in 2004 and he has grown in his level of responsibilities to the role of Vice President of Operations. Mr. Peck’s tasks include: coordination of all production design work for the company, ensuring that the project managers in the design group are fully utilized; and coordination with the survey and utility relocations departments to ensure all aspects of projects are being completed. Mr. Peck has grown GUY’s inspection department from 3 certified inspection team leaders performing 400 inspections a year to 6 certified inspection team leaders with 3 inspections assistants and the department now performs 800 inspections each year. In addition to his engineering accomplishments Mr. Peck has spent countless hours mentoring high school students at Fusion Youth Ministries at Believers Church in Tulsa, by serving as a role model in their development. As a founding Board Member of Engineers in Action and a founding member of the Engineers Without Borders – USA Oklahoma East Chapter, he has worked to bridge the gap between engineers and indigenous communities providing clean water, sanitation and irrigation. His work with Engineers in Action was to establish the organization as a vital link between engineers and other non-profits and the citizens of Bolivia. Mr. Peck has stated in regards to his work with Engineers in Action and Engineers without Borders, “I find that my central duty as a civil engineer is not just to those who have the wealth to build the complex infrastructure we have here in the United States, but also to those who require the most basics of infrastructure, such as clean water for their families.” If you would like to know more about Engineers in Action, you can visit their website at engineersinaction.org. Mr. Peck continues to work in his community and serving the public of Oklahoma. As it is stated in the Statues Regulating the Practice of Engineering in Oklahoma, “It is a privilege to practice engineering in order to safeguard life, health and property, and to promote public welfare.” Mr. Peck takes it as an honor to all whose lives are impacted by his and his colleagues’ efforts.